September fall special discount price $118 discounted from $130 a nite for the month of September. Tioga is open to Yosemite 2 hours away. NEW in Our Condo: Private Wifi, New King sized Casper Mattress. Our tastefully furnished one-bedroom condo on the quiet side of the Grand Sierra Village (FYI:construction underway adjacent to building) features a fully equipped kitchen, with granite counter tops, microwave, full-size fridge, stove and dishwasher; a king-size bed in the bedroom; a queen-size sleeper-sofa in the living room; a nice balcony with a view; two TVs; a DVD player; Wi-Fi DSL high-speed internet; and a gas fireplace. For your convenience, a free ski locker is included (bring your own lock). The Grand Sierra Lodge is the newest and nicest lodge in the Village! There's free use of the under ground parking,fitness center, locker room and the best pool and spa/Jacuzzi in Mammoth. A game room and washer/dryer facilities are located on premises. A beautiful fireplace and meeting area grace the magnificent lobby, and it's only steps away from restaurants, nightlife and shopping! All adjacent to the stop for the free trolley transportation to the Mountain or town. With direct flights, Mammoth is easier to get to than ever before! Experience top-rated terrain and award-winning snowboard parks and revel in what Powder magazine describes as 'some of the most consistent snow on the West Coast'! Fly direct from Los Angeles, Denver and San Francisco from $79* Book online through United. Please check the availability calendar first. It's updated regularly. Note: Full amount due for booking reservations. Until confirmed, rates are subject to change without notice. We, as private owners and local residents of Mammoth Lakes, enjoy the year round lifestyle our community has to offer. Epic skiing, golf, biking, boating and hiking in the summer round out our options! We are active members in our town and enjoying sharing this destination resort with folks from around the world. Let us host your vacation! Bring your bathing suits….Best pool and Spa in Mammoth. Always something going on in the Village. Great cozy place for a family of four. Great place to stay for our Mammoth ski trip . Very convenient for shops and restaurants at the Village. Gondola ride to the ski slopes was nice. Marc and Lou gave great instructions for Check in and check out and responded quickly to questions. We enjoyed our stay. Great location, clean, clear instructions for accessing room, locker, and parking. The location is perfect with easy access to the Canyon Gondola. The place is well appointed. The price was right. It is relatively small - perfect for two people. There was a decent supply of spices for cooking and plenty of utensils. When we had a problem with our key card, the owners were very responsive and remedied the situation quickly. My only criticisms were (1) there was no dish soap, so we purchased some in town and (2) the toilet often doesn't flush properly. Great condo in the heart of the village! What a great location! 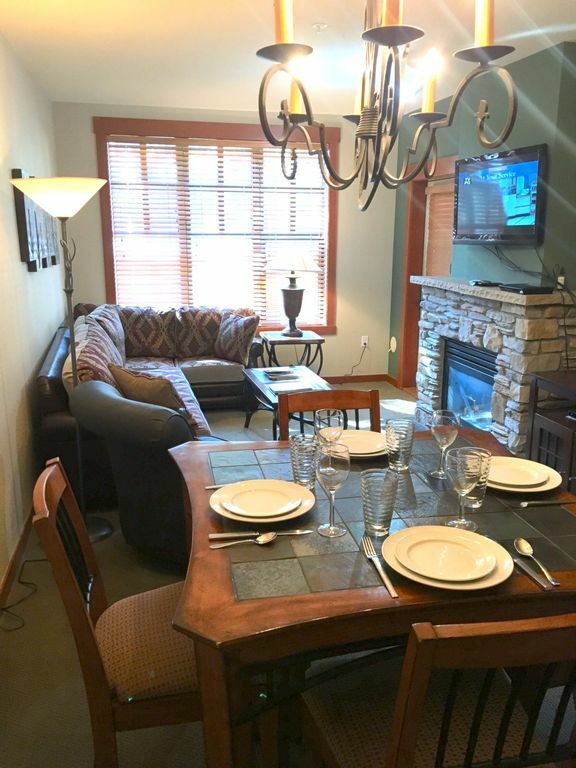 This condo is right in the middle of the village with easy access to the gondola and a great pool and hot tub for soaking after a long day of skiing. The condo is clean and has all of the amenities you would hope for. The owners are very nice and communicate well. There were a few hiccups with the hairdryer and the toilet but I passed them along to the owners who I am sure will address. This is the 2nd time we have stayed here and it will definitely not be the last! The condo had everything we needed. Lots of clean towels, comfy bedding and very clean. Location was great especially having a little one it was great to have the village amenities right there. additional costs: Tot tax is 14% of lodging,cleaning fee of $95.00 and 3.25% payment processing fee. Cancellations: 100% refund when condo is rebooked Note: Full amount due for booking reservations. Until confirmed, rates are subject to change without notice.